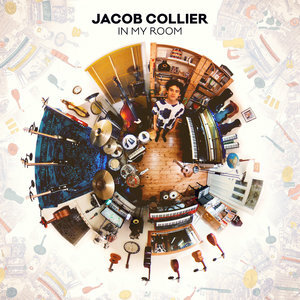 Little Jacob Collier spent a lot of time in the music room of his family’s home and after years of spending thousands of hours there and filling the room with an abundance of sounds, he has now ended up on Quincy Jones‘ label. I saw him back in January during the annual APAP convention and was totally impressed by his musicianship and artistry. His version of Stevie Wonder‘s “As”, in a duet with singer Becca Stevens, is still one of the highlights of this year. And Jacob recorded another Stevie song for his debut album which he recorded, performed, arranged and produced in his room with no additional musician, but with mastering engineer Bernie Grundman, another veteran and legendary music person. “You And I” ends up as the beautiful love song it was originally written in the early 70s by Mister Wonder, convincingly performed by this young cat. Elsewhere on the album, we get the Brian Wilson song “In My Room”, fittingly designated as the title cut and a lot of brilliant original compositions, both in the uptempo and wilder world as well as in the ballad section, like the ebullient opener “Woke Up Today” or the dreamy “In The Real Early Morning”. The only setback I realized while listening to this album a lot in the past weeks, is a little vocal inflection which reminds me of a frog and the unbearable ending of “Don’t You Know” which is simply annoying. Other than that, kudos to young Jacob!